How you can avoid distractions and overwork and assure your success in any activity. The first step you must take to successfully organize anything, whether it’s your own career or an entire company. 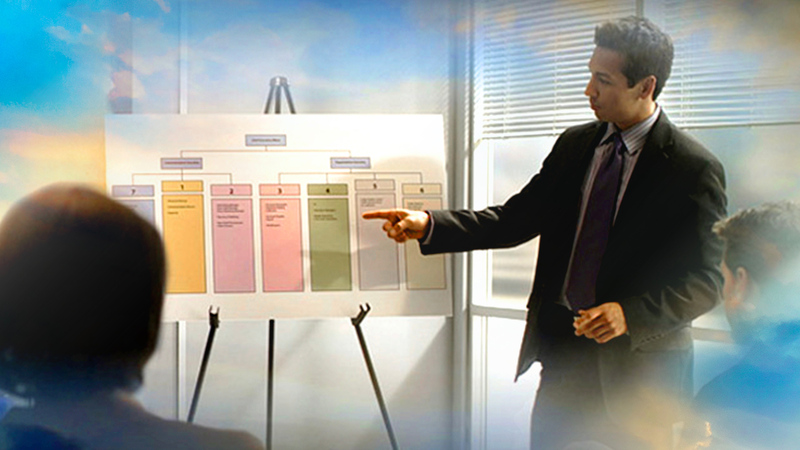 What an Organizing Board is and precisely how you create one to make your activity, project or group more productive. Anybody recognizes that if things were better organized people would be better off. We have all had experiences with bureaucratic red tape, impersonal government agencies or careless commercial enterprises. The problem of poor organization is serious and costs trillions in waste, inefficiency and lowered productivity. On a more individual level, organization is a key—and often missing—factor in personal success. It is also a necessity for a flourishing family. Attainment of one’s goals, no matter how small or how large, requires a knowledge of organization. How do you most efficiently and productively manage your time, your activities and your resources? How do you minimize distractions? And how do you align your strengths in order to accomplish your purposes? L. Ron Hubbard recognized that Man was as lacking in understanding of how to organize his activities as he was about his true spiritual nature. And a sizable portion of his research was devoted to clarify the subject of organization, a task he fully accomplished. This course contains only some of the most basic principles of the organizing technology he developed, but these fundamentals are, by themselves, enough to greatly enhance the activity of any endeavor, whether that of a group or an individual. Chaos and confusion are not natural conditions of life. They only exist when natural laws are not understood and followed. Here are some of the natural laws of organization and organizing. 4 to 6 hours. You may, however, do the course at your own pace. In other words, it is not timed. The course is our service to you, free of charge. Upon completion of The Basics of Organizing Course, you will receive a certificate by e-mail. “I have acquired a greater knowledge on the subject of organizing, which was very limited in the past. Now I am confident on this subject and whenever going for any activity, I organize myself with the twenty-one departments from the booklet, and start accomplishing the work properly. “I am applying this in my personal life, family life and also in my organization where I am working and getting positive results. I have changed the organization board of my company, and everybody appreciated the initiative. “As we specified the functions and jobs to be completed by all departmental posts and their co-workers, the monitoring of work has become more specific and effective. “It is a very powerful opportunity to learn how can I improve my quality of life, by putting these methods of the Basics of Organizing into practice. “It was a wonderful course—it taught me how to organize myself better to be able to produce, and I realized how lost I was with regards to being organized in all aspects of my life. “Discovering all this was a whole experience and with this knowledge I can help others to know about this course and so help themselves to grow and improve their lives as people and as leaders. But first, one has to organize oneself to be an example for the rest.